Many of us behind We ❤ Health Literacy also ❤ the semicolon. If prompted, we might even gush about its unique and graceful qualities. So it’s with a heavy heart that we must declare — once and for all — that the semicolon has no place in plain language communication. Here’s why. First, many people don’t use the semicolon properly, making it a recipe for confusion. Because you are so wise, dear readers, you know that semicolons are used to connect 2 phrases that could stand on their own (i.e., independent clauses) but are related enough to warrant a connection. Unfortunately, though, many people don’t know this; thus, they use it incorrectly. Second, the semicolon can feel very formal and academic — stuffy, even. And while we don’t think it necessarily deserves the bad rap, we can’t deny the association (think legal documents, research papers, and never-ending lists). You can also consider the other punctuation marks you have in your grammar toolbox. In case you haven’t noticed, we’re particularly partial to the em dash ( — ). And if you’re using semicolons because you have a long list of items, use good ol’ fashioned bullets instead. But in your personal correspondences and literary contributions, disregard this advice and knock yourself out with the semicolon. 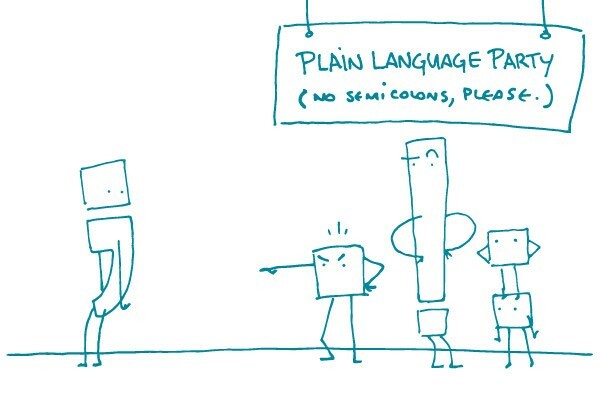 The bottom line: Semicolons just aren’t invited to the plain language party — but you can make it up to them later.